A 2D turn-based strategy game set in an original science-fiction universe developed by the creators of FTL: Faster Than Light. Into the Breach is a 2D turn-based strategy game set in an original science-fiction universe. The game, available on PC, has been developed by an independent studio – Subset Games, also known for creating a best-selling game called FTL: Faster Than Light, released in 2012 on PC / Windows. Into the Breach is the second project of the aforementioned studio. Even though the game does not deviate much from the FTL’s formula of a spaceship simulator. It, however, features a number of unique elements, such as the visuals’ style or the ability to command one’s subordinates. 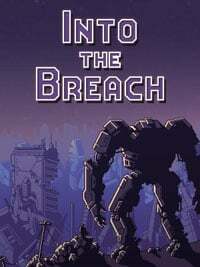 Into the Breach is a minimalistic turn-based strategy, in which one assumes the role of a commander of small mech squads that protect what remains of the human kind against aliens that lurk deep beneath the ground. The action of the game is set on small, procedurally generated 2D boards covered with 64 squares, between which both the player and his opponent can move their units. It is up to the player to defend civilian settlements and small towns against Alien attacks. In combat, one controls mech robots, which in between the missions have to be equipped with various weapons. A player can also choose the pilots to control these mechs – their unique abilities are crucial for the result of each battle. Because of the relatively small maps, the missions are quite short – that, however, does not mean, they do not pose a considerable challenge. Players should approach them as if they were logical puzzles with several optimal solutions. One has to pay attention not only to the opponent’s movements but also to the arrangement of all the units on the board that might affect the mobility of player’s mech robots. Into the Breach offers pleasing to one’s eye 2D visuals, featuring 16-bit retro style and often reminding one of FTL: Faster Than Light. The gameplay is accompanied by the high-quality electro soundtrack. The guide for Into the Breach contains valuable information that will help you finish the game in a timely fashion. The guide contains the list of the available mech classes and a description of mechanics and game rules.